In large bowl, mix oats, brown sugar and milk; let stand 10 minutes. Meanwhile, in small bowl, mix yogurt and maple syrup until well blended; refrigerate until serving time. Stir egg product and oil into oat mixture. Stir in remaining ingredients until blended. Let stand 5 minutes longer. Meanwhile, heat waffle maker; grease with vegetable oil if necessary (or spray with cooking spray before heating). For each waffle, pour batter by slightly less than 1 cupfuls onto center of hot waffle maker, spreading batter to edges. (Check manufacturer's directions for recommended amount of batter.) Close lid of waffle maker. Bake 4 to 5 minutes or until steaming stops and waffle is golden brown. Carefully remove waffle. Repeat with remaining batter. 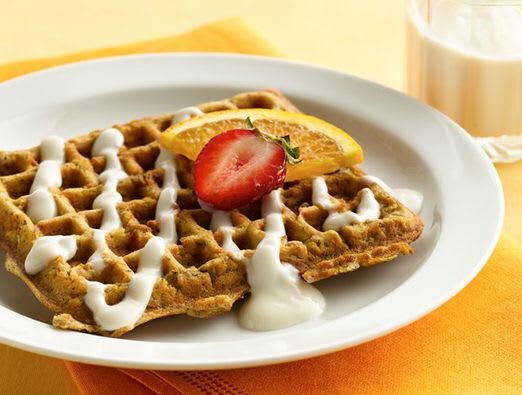 Serve waffles with topping. A good habit to get into is to add oats, wheat germ, flaxseed and other heart-healthy grains to your baked goods.